Eggplants have been one of my favorite vegetables. This vegetable is so very versatile and can be prepared in so many ways that it is easy to favor this vegetable. Especially in every day cooking when we are looking for something that is quick and easy to make and yet is flavorful and works well with both steamed rice or with Indian flat bread. This methi baingan fits the bill in all respects, its really quick, simple and flavorful and tastes awesome with both rice or roti. I've seen a lot of versions of this curry with fresh methi leaves, but I prefer making this with dry methi leaves mainly because it is way faster and can be made year round without worrying about the availability of fresh methi leaves. The methi adds a very different flavor and dimension to the curry that I feel elevates the the curry to a completely level different level. To make your own Garam masala check out this post. Soak kasuri Methi in warm water for at least 15 minutes. Prep the vegetables and keep aside. Heat oil in a large heavy bottomed pan, add cumin seeds. When the seeds sizzle add green chillies and stir a couple of times. Add onion and sauté until onions are transparent. Add minced ginger and stir a few times. Add tomatoes, all the spices , a pinch of salt and stir until tomatoes are cooked and tender. Drain soaked kasuri Methi and add to the tomatoes, stir a few times. It's okay if some of the water that the kasuri Methi was soaked in gets added to the tomatoes too, just stir until the water is evaporated. Add eggplant, salt to taste and cook the eggplant until it is soft. Make sure to stir frequently to ensure the eggplants cook evenly. When the vegetable is cooked and soft, remove from heat. 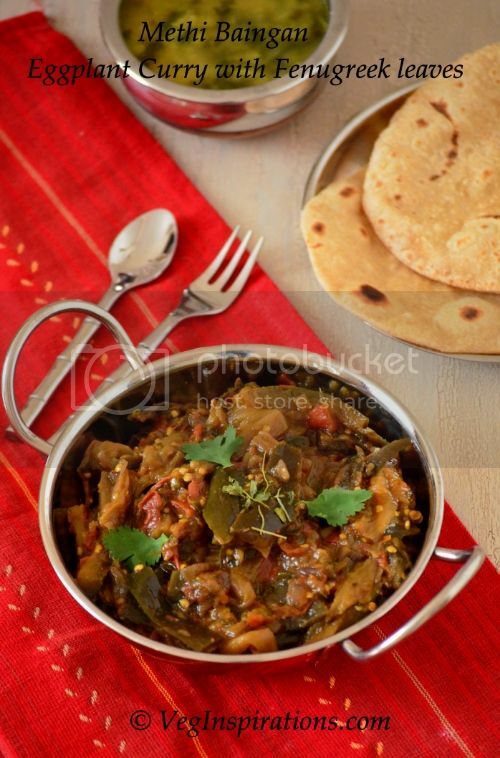 Serve hot with any kind of Indian flat bread, or with some rice and dhal or rice and kadhi.